N Blog (110126 16:09) – ‘A notice without warning’ | Where's Natsuki? Recochoku will also include off-shots to download (*ノωノ) Check it! It was cold… and due to the coldness..
I’ve taken on jelly-eating power! I have to stay hydrated! 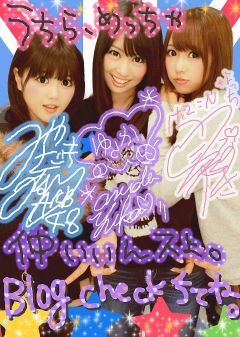 This entry was posted on Wednesday, January 26th, 2011 at 4:47 pm and is filed under AKB48, N Blog and 佐藤夏希. You can feed this entry. You can leave a response, or trackback from your own site.